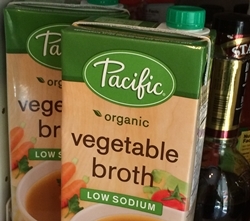 I have an essential staple in my pantry: vegetable broth. Lots of recipes call for broth, as you well know. Usually they call for chicken broth or beef broth. But to me adding chicken broth to a chicken dish or beef broth to a beef dish is carrying coals to Newcastle. And why add chicken broth to an otherwise vegetarian recipe? Makes no sense. Vegetable broth, however, is a nice, neutral broth that can be used in any dish without affecting the flavor. I only have to worry about having one kind of broth on hand and I can call on it whenever broth is needed.